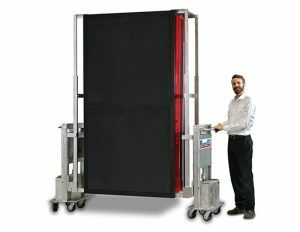 The RL5000E Rack Lifter provides a safe method to move heavy loads such as Staged Server Cabinets, Battery UPS, and Computer Room Cooling Units up to 5,000 lbs. The lift is accomplished with the touch of a button. Using this server rack mover one technician can move a fully loaded rolling server rack unassisted from one location to another. The weight is spread across eight dual castor wheels to distribute the load on raised floors. The RL5000E is used to move loaded racks from one position to another or to lift loads from a pallet. This is the ideal rack mount lift tool. A variety of different racks, empty or fully populated, can be lifted and moved using rack mount lift adapters. 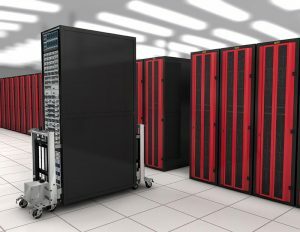 Two units are used in tandem – one on each end of the server cabinet. To ensure safe and secure transport the server cabinet is bolted to the adapter frame. The RL5000E is designed for ease of operation. Both units are placed in position and secured to the rack housing. The operator uses a simple up/down control switch to raise and lower the load. Vertical travel is synchronized by a control cable connecting the two units. The load is raised for transport and a single operator then moves a 5,000 lbs. load into position easily and accurately. Once the desired position is achieved the load is lowered to the floor and the two units are removed. When the RL5000E is not in use it can remain on charge mode to ensure it will be ready when needed and to increase battery life. The smart charger will not over-charge the batteries.